Tired of Restarting Your Wireless Router and Cable or DSL Modem to Restore Lost Broadband Connections? We know the feeling. There are few things that are more frustrating than suddenly losing your broadband internet connection. Cable modems, DSL modems, and wireless routers often do not automatically recover from lost connections; you remain disconnected from the internet even after connection to your home or business has been restored. The way to solve the problem is usually simple enough: reboot your networking equipment and perhaps your computer. Depending on how close you are to your networking equipment, how quickly connection to your home is restored, how frequently your connection goes down, and how much you depend on your computer remaining online this problem may be just a minor inconvenience or a constant source of worry, frustration, expense, and lost productivity. Reboot Your Routers and Modems On Lost Connections and Get Back Online Automatically! With a combination of exciting, inexpensive, and versatile commercially available hardware and our innovative software you can say good bye to the frustration of worrying about your internet connection and let your computer take care of it for you! Read our Solution Overview for details! NEW: Try this solution in one box! 10/8/12 - New Version 1.4! Learn Why We Created ItsBackOn! Designed to run in the background without slowing down your computer. Automatically checks availability of internet connection at user-configurable intervals. User-configurable retry delay and number of retries to minimize modem restarts when connection can be restored without them. Built-in interaction with X10 home automation hardware to automatically restart networking equipment. Ability to execute any user specified command or script on power off and power on allowing interaction with many other devices. User-configurable delays for power off and power on to allow enough time for your hardware to fully turn off and fully turn on. 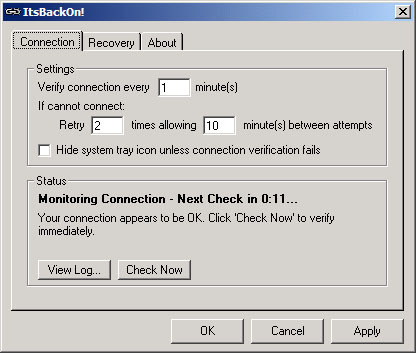 Offers a user-configurable option to automatically restart the computer if connection is not restored after a specified number of modem restarts. Optional confirmation prompts prior to router and computer reset. Provides user with constant status updates via system tray icons. Offers the option of not showing a system tray icon unless there is a problem. Automatically time-stamps and logs operations to disk. Compatible with XP, Vista, and Windows 7 (32-bit and 64-bit), including limited accounts. Special Introductory Discount: ItsBackOn! is designed to be easily affordable at just $49.95. As a way of introducing our software we are offering it at a 50% discount to the first 1000 purchasers! X10 offers a comprehensive line of exciting and inexpensive hardware enabling sophisticated home automation, security, surveillance, and more with no new wiring or monthly service fees! Allows you to control any device in your home with a wireless remote, computer, telephone, or via a remote connection! Uses your existing wiring leading to simple installation! Works when computer is turned off! Offers a full selection of modules, dimmers, switches, sensors, cameras, alarms, remotes, and more allowing you to create a home of the future! 30-day satisfaction guarantee and free shipping! ItsBackOn! is designed to integrate with ActiveHome and ActiveHome Pro automation software included with X10 Automation Packages. ItsBackOn! uses 1 X10 Appliance Module. And much more. Visit their web site for complete information! We believe X10 to be the best solution for consumers and small businesses wishing to automatically reset their networking equipment due to low cost, ease of installation, and tremendous usefulness outside of this application. Remote power switches and other hardware solutions exist, but the ones we have found tend to be much more expensive and less versatile. ItsBackOn! allows the user to specify a command to execute to turn off/on power and so can interact with any device that can be controlled from a software program. If you have better recommendations for hardware please let us know. NEW: Auto Reset on Connection Loss + Remote Power Switch for just $100! Reboot Your Router remotely and do much more with Home Automation! Remote Power Switches from Amazon.com! Protect Yourself from viruses, spyware, and intruders!